Place it across the knee and rub soap on it. To wash using a toweling mitt, rub it over soap which is held firmly by a magnetic/suction soap holder. Use a self soaping sponge or a body puff sponge, as this will hold soap in the sponge. Place sponge on a flat surface, under a hand pump soap dispenser. Use a sensor soap dispenser; this will automatically release soap once your hand or sponge is placed underneath. Wash hair over a bath with shower attachment from taps or use shower. Use flip-top bottles and tubes which are easily controlled. To blow dry, place the hair drier in a wall mounted stand or table top stand and move flexible arm of stand to the right position – the hand of the functional arm is free to use the brush. A hot brush or a cordless hot brush may be easier to use. Have hair done regularly by hairdresser and choose an easy care style. Use an electric razor for your face. Use a hair removal cream for underneath your arms. Consider getting waxed by a professional. There are various permanent or semi-permanent hair reductions available from professional beauty therapists. 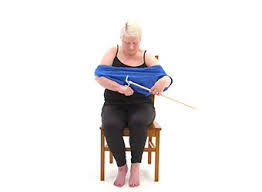 Hold the emery board by sitting on it (i.e. between your thigh and the edge of a firm seat). Use a suction nail brush / emery board attached to bath, basin or table. Emery board can be held on a piece of non-slip material or secured to surface by doubled sided sticky tape or stuck down at each end with ordinary tape. Have your nails manicured at a local nail salon. Use toothpaste dispensers (i.e. those that you press down with your thumb to dispense) or flip lid toothpaste tubes. Rest the toothbrush on the sink or side, or hold between your lips whilst applying toothpaste. Squeeze toothpaste in your mouth and then begin to brush your teeth. Floss your teeth with a disposable flossing tool which has a handle. Brush using a tooth brush. Rotate the teeth till done all over. Use a toilet paper dispenser (similar to those in public toilets). Pull the desired amount, put forefinger and thumb on either side of the paper by the perforation, use your thumb to piece the perforation line and tear off paper. Position toilet roll holder on the side of the functional arm, if because of the design of the bathroom this is not possible you could use a floor standing toilet roll holder, but make sure it is heavy enough to stand up whilst you are pulling off the paper. When putting an item of clothing on, always start by dressing the affected arm first. Clothes with some elasticity may make things easier e.g. Lycra, elastane, knitwear. Garments with deep roomy armholes, or elastic waist lines, large neck or front/side openings are easier. Opening to waist level to make it easier to step into garment or pull over head. Partly fastened garments may also provide an easier way to put them on. Do hooks up in front, swivel bra round waist and then pull straps up (elastic straps are easier). A sports bra which has no fastenings can be pulled over your head. Adapt bra by having D-ring fastenings with a Velcro loop (if you would like to, feel free to discuss this with your occupational therapist). Most can be mastered one-handed but the shirt cuff button on the side of the functional arm can be a problem. Sew the cuff button on with elastic thread so that it is possible to push hand through the fastened cuff. Fastening the button first and put hand through the cuff. Use Velcro with button sewn back over the button hole. Raise button from fabric by sewing them on with a long shank, backing the top button with a smaller one, or putting two round buttons together. Elastic laces or curly laces – once inserted and fastened, stretch to accommodate the foot. To tie up a shoe lace the one-handed methods require you to use ring, index, and middle finger and thumb to tighten the bow. See video to watch.